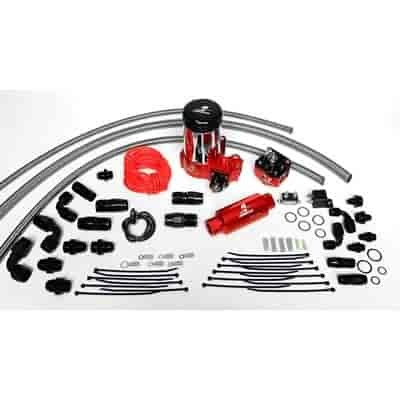 Designed to provide the do it yourselfer with ''ALL'' the hardware necessary to properly install an Aeromotive Fuel system on everything from a stock bodied muscle car to the most radical Pro-Street cruiser. Designed to provide outstanding performance throughmatched component selection and correct installation. Universal kits provide the results only years of experience can match,eliminating confusion,wasted time and unnecessary expense common to designing a complete system from scratch. These universal bolt-on fuel systems are made for either carbureted or fuel injection. They include what's needed to get your ride up and running except the fuel tank. Aeromotive makes it simple to figure out which kit you need! All you have to know is whether you need a carbureted or fuel injection kit and your intended use. It's that simple! Each kit includes an electric fuel pump, pressure regulator, fittings, stainless steel braided fuel line, fuel filter, zip ties, and wiring kit.